For those who missed it here. My whole Tour diary is now available on Parallel.Cymru. Extra notes about music and a links! 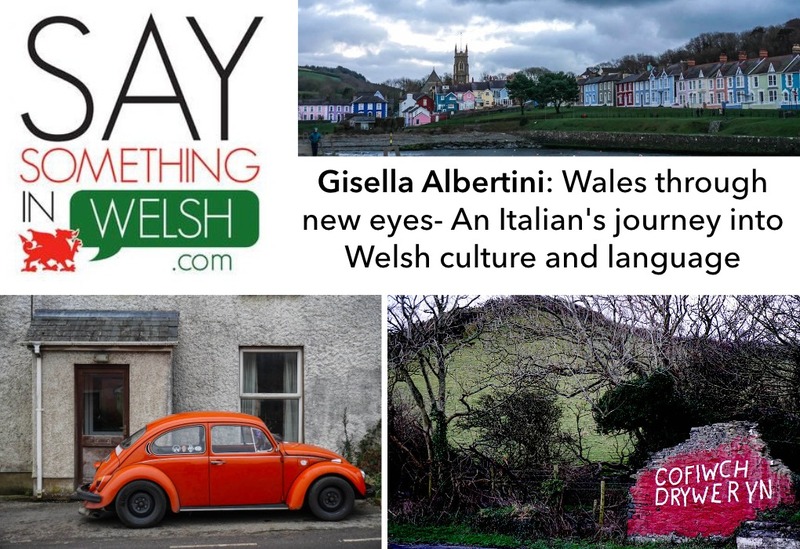 And - an extra “chapter” about what we Italians know of Welsh culture and tradition (or I should say what we don’t know…). It looks really good, Gisella and is enhanced by the photos. Croeso, non c’è di che. By the way your answer made me think how easily people write to criticize, and don’t take time to express appreciation. I thought anyone would be happy to know that someone considers what they do the best in the world and has fond childhood memories about it. Or if someone from their family’s country of origin talks about them or even just likes their accent. Right? So I looked for a contact and wrote them about the article. One of the Carini sisters currently running the activity answered and was indeed happy, enjoyed reading it and even shared it. Plus, I can taste a Carini’s gelato for free and meet the family when I go to Ebbw Vale. I’m pretty sure they would have one also for the one who mentioned it first - if he’d like to be my guide. Love it, and the photo and music additions are great. I’ve really enjoyed hearing all about your trip to Wales, and I look forward to the next tour diary! Yes @HuwJones, you’re the official Ebbw Vale & Beafortese expert! And thanks a lot @AnnaC! Fantastic @gisella-albertini, all you need to do now is to sort out @siaronjames’s dad’s Vespa…for part 2 of the Trilogy. If you are heading to that area, I’d recommend a view a couple of miles north out of town (literally) from Beaufort towards Llangynidr to see the panorama across a substantial chunk of the Brecon Beacons National Park. Admittedly there is some strong competition but it is certainly up there as one of best views in Wales - totally unspoiled. There is nothing there except for a view northwards from the ‘rooftop’ of South Wales. From right to left you can see from the Sugar Loaf, The Black Mountains, Llangorse (a moraine lake) around to the north facing bluffs and peaks of the Central Beacons - including pen-y-fan - from about 2000ft - possibly more… it’s a bit of a local secret (sort of). Thanks again, and thanks also for the tips. I think that watching “Lowri Morgan: Her 333” I got a vague idea of the view of that area. Looks great!!! Funny thing, about perspective: now you said it could be challenging for the Vespa, I had a quick look at Google Maps and saw the highest point on Pen Y Fen was 2799. So at first I thought “yeah that could be really complicated, although I didn’t expect to be able to reach that height on a Vespa”. Until I noticed it was measured in feet not meters! You know, I live near the Alps…! Well, a couple of weeks ago, I walked from Torino up to the park on the top of the hill. That’s pretty much the same height of the Pen Y Fen. I’m pretty sure a Vespa can deal with it! Yes you’re right - the Alps are a tough yardstick…! …but I’m sure an experienced Italian scooter rider on an Italian scooter would breeze through it! I absolutely second that. I remember when Ebbw Vale still had a steel works, the remarkable contrast between the industrial (and heavily polluted) Ebbw Valley and the different beauty of rural Breconshire. My brother and I used to compete to see who would spot Llangorse Lake first as we descended towards Llangynidr. Llangynidr has a nice pub near the Brecon-Abergavenny canal with a spectacularly long tunnel nearby. The lower villafe has an impressive bridge across the river Usk which requires an exact knowledge of the width of your car to cross safely. Yes it is a bit intimidating to see all the different colours of paint on the purpose built width restrictors on the bridge isn’t it! Not for the faint hearted! an impressive bridge across the river Usk which requires an exact knowledge of the width of your car to cross safely. That’s one of the reasons why I prefer two-wheeled vehicles. Talking about mountains…this reminded me when we used drive a 750 cc Panda -old tin can version!- up the Moncenisio Pass (about 2100 mt) to go see shows in France near Chambery, sometimes further. Then came back to Torino after the gig. Plenty of hairpins! However I haven’t been able to figure out what two going up at the same time means @rich . …and it isn’t possible to have any speed or momentum going into the bend because you turning 180 degrees at the same time…surprisingly awkward! You sort of run out of speed and quickly have to change into first…with quite a big drop to one side! Oh I will have to make sure to include the zig-zig in my route. But on 2-wheels cause, despite long experience, being stuck in a car close to a big drop makes me really anxious and scared! However on these roads, an electric bike like those @Gog and @Tricia had suggested would probably be the best. The region around Ebbw Vale and Llangynidr has, as you might expect, a rich industrial heritage with plenty of buildings and artefacts from canals, limestone quarries, very early horse-drawn and steam railways, mining museum (notably the Blaenavon Big Pit) and mines which pre-date the industrial revulution. Very near the house where I was born in Beaufort, a number of childrens’ bodies were found in some very early mines. Because of my advanced years, I feel part of history and vividly remember viewing the massive Ebbw Vale steel works from the family’s first home at “Glynarthen”, Holland Street. I recall an awe-inspiring inferno of blast and Bessemer furnaces, steam shunting engines and the orange and yellow hillsides painted by the exotic oxides and sulphides belched out by he furnaces. It was beautiful! Lots in Blaenavon - Big Pit, as mentioned, but also the ironworks. Personally, I like the Clydach Gorge - less touristy and very tranquil. I remember abseiling off Clydach viaduct, but there’re lots of other sites to see in the gorge. There are some pics of Clydach ironworks and other Clydach places on this site, but also lots of other sites nearby, so as far as industrial heritage goes, you’re spoilt for choice! The towpaths along the canals make a level, scenic bike ride. The Mon and Brecon, The Montgomery and the Llangollen canals, you may even get a lift on a narrow boat. The Pontcysyllte aqueduct at Llangollen is a world heritage site designed by Thomas Telford. Pob lwc with your plans. Io anche so parlare italiano. Abito negli Stati Uniti, ma nacqui in Finlandia e parlo inglese e finlandese.